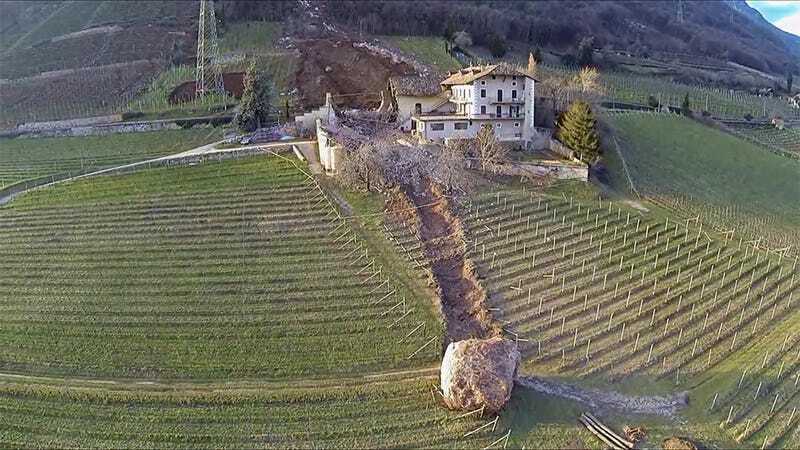 Capricious Mother Nature destroyed a building with a giant boulder in northern Italy, with an even bigger boulder missing a three-story farm house by a just few inches, stopping right at its main entrance. According to Italian newspaper Il Corriere della Sera, the landslide happened in the village of Ronci Termeno, in South Tyrol. The rock that stopped right in front of the house is 5,650 cubic feet. Geologists and emergency crews are still evaluating the risk while clearing the ground. Judging by the giant boulder which was already resting on the field, this hasn't been the first time this has happened. There's a page in Facebook where you can learn how to help the people who live in this farm. Aerial images captured by the drone video by Markus Hell.